When our artists turn on the chainsaws and spray the ice crystals in front of your audience, the wow effect is guaranteed. 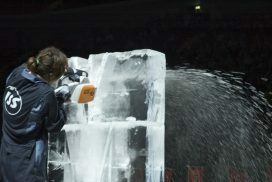 In a 15 - 20 minute show, we create your logo, claim or product made of crystal clear ice live. The show will be perfect with a concluding fire spectacle. 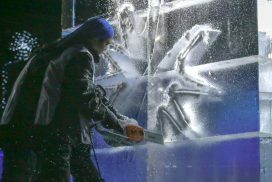 Whether it's an opening, a kick-off event or a product launch, you will be able to give your guests lasting impressions - and conversation material for the subsequent reception - for example at one of our ice bars.